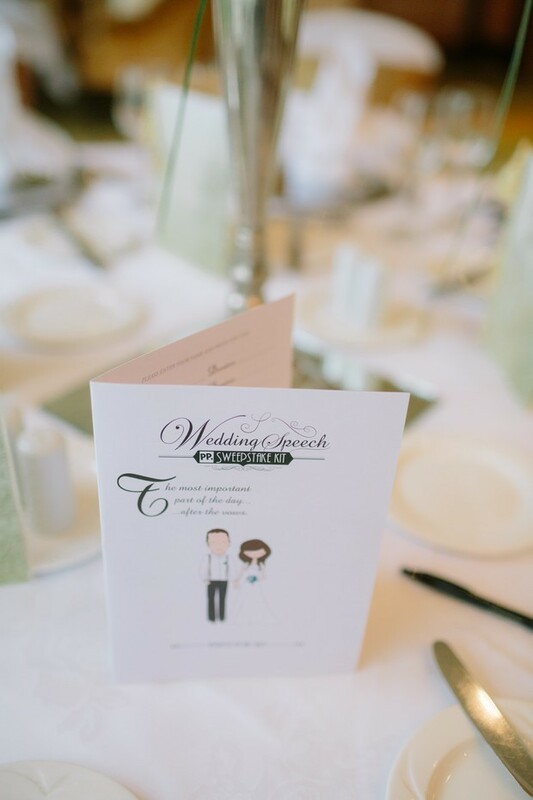 We love details and if they’re personalised, even better! 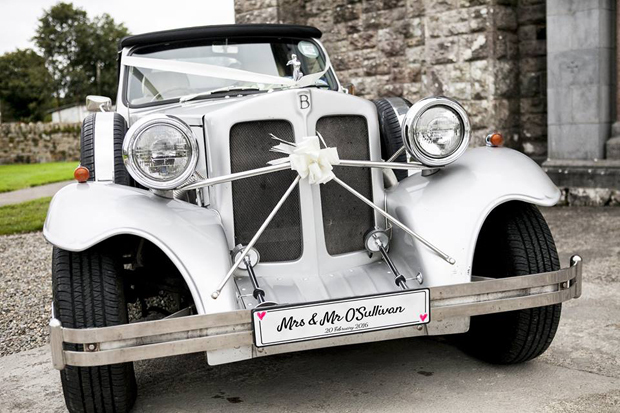 You can personalise just about anything for weddings including the number plates for your car. Yep, Irish company Printpoint.ie can create these awesome personalised Mr & Mrs number plates so you can drive away with your new surname or nicknames proudly on display. 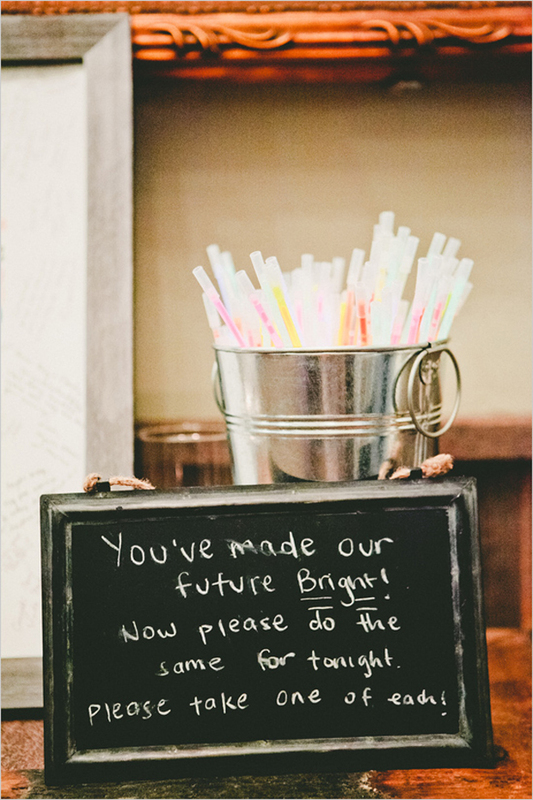 They also do ceremony and reception signs if you’re looking to bring that personal touch to your decor too! Check out more ideas here. We’re loving balloons at the moment – they’re brilliant for creating a fun, celebratory feel and there are so many places you can use them. 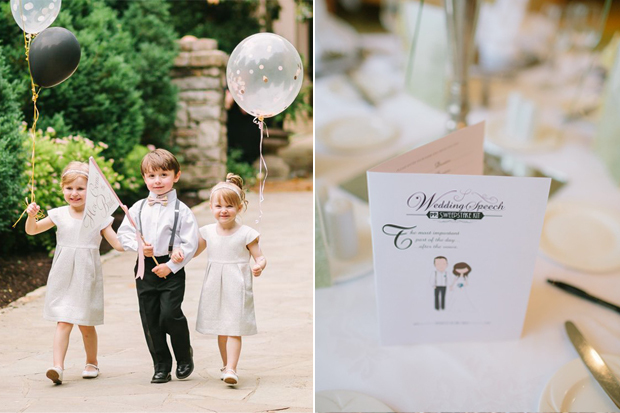 Get the celebrations off to a good start and have your flower girl or page boy walk down the aisle with a whimsical balloon in hand – scribble ‘Here Comes the Bride’ with a marker as an extra cute touch. It goes without saying the kids will love it and it’s sure to keep them amused during that post ceremony lull too! Lots of couples want that iconic confetti shot in their photo album – it looks AMAZING and is a ton of fun! If you’re mad for your confetti moment and your venue is okay with it (some venues and churches aren’t too keen so check before), you’ll love this mini trend we’ve seen popping up on Pinterest. 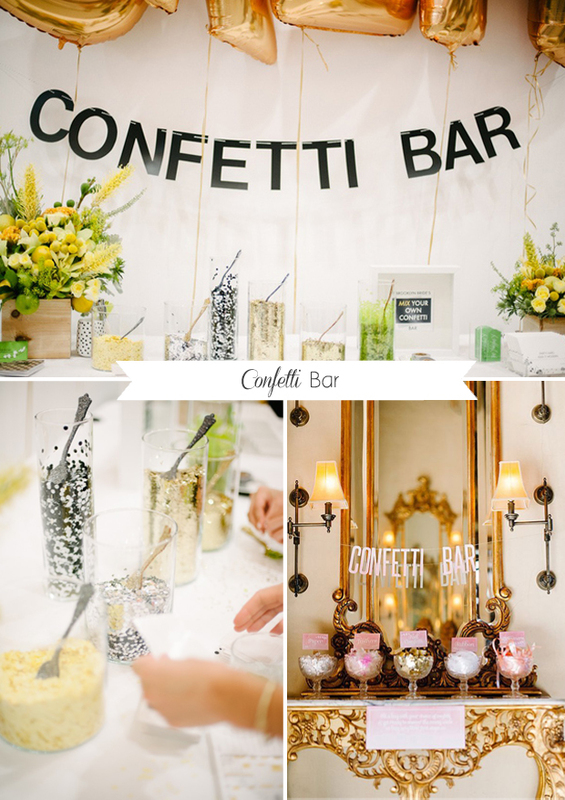 Cool couples have gathered an array of sprinkles, paper and glitter and created their very own confetti bar so guests can pop it in to their cones come celebration time. 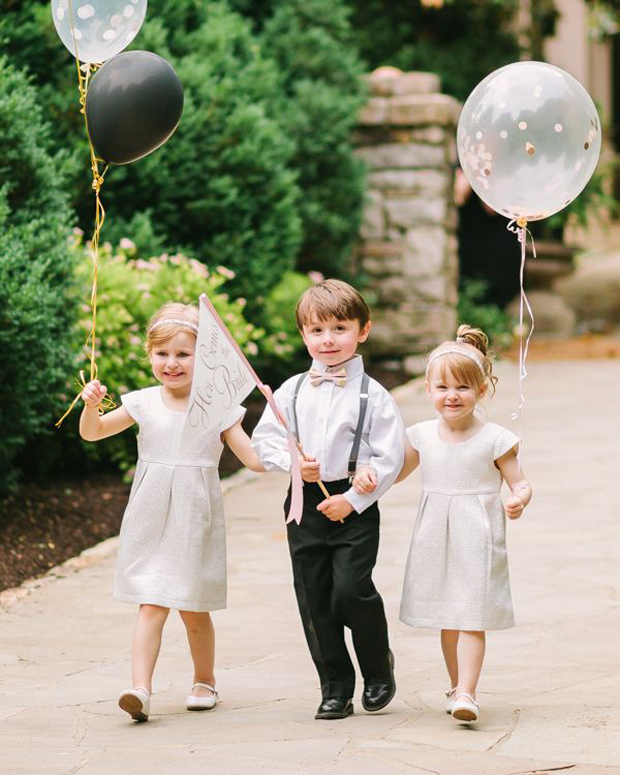 If your venue isn’t big on confetti, fear not – there’s lots of other cute ways to create a fun and celebratory ceremony exit – check out 11 creative ideas here with everything from bubbles to balloons. 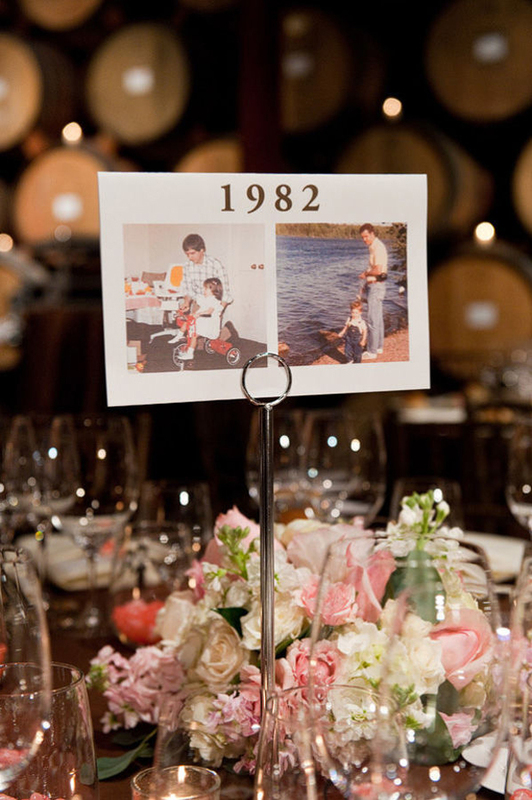 If you’re feeling brave and want to bring the fun to your table names, work in some childhood snaps to give guests a laugh. Table names are one of the best and easiest ways to personalise your day and everyone will love seeing some hilarious teenage photos of you both. Simply pop pictures of you and your partner side by side with the year and print them up! So the superhero cake won’t be everyone’s cup of tea but if your wedding is a family affair or you’re looking to include your kids’ fave things in your Big Day, this could be right up your street. It’s a definite showstopper and you can be guaranteed, it will be popping up on everyone’s Instagram feed. Or if you’re keen to go traditional but your other half is adamant he wants some superhero fun, you can have the best of both worlds – crafty cake makers can create a cake with two very different sides! 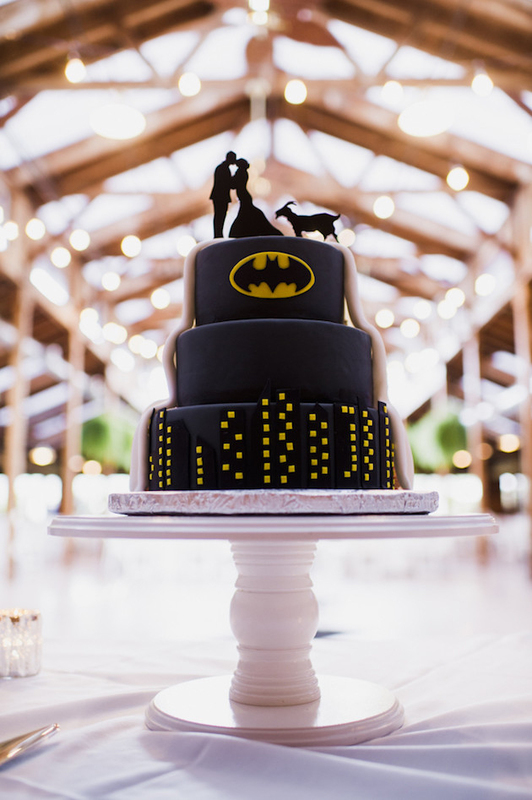 Just check out this amazing half and half cake from Amazing Cakes which has a beautiful timeless ivory finish on one side and a fun batman logo on the other! Another fun way to get guests involved is with a wedding hashtag. 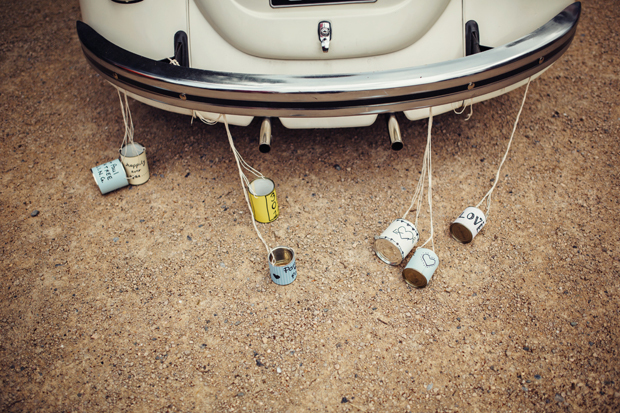 It’s a great way to gather lots of random pics from your Big Day and guests will love snapping away and sharing too. 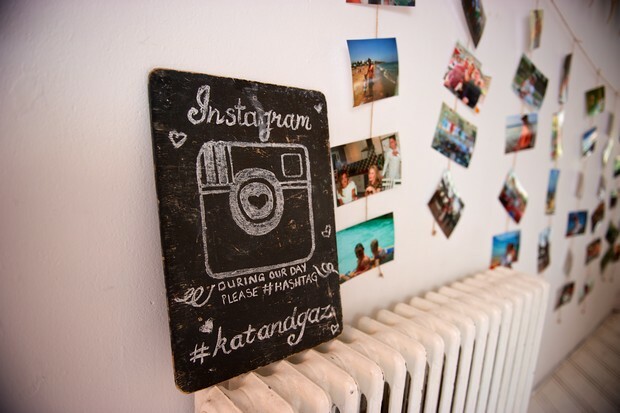 Create a hashtag and use either Wedpics or Instagram to get your photo fix until the official photos come round. Games are great way to keep guests entertained after the ceremony while you’re off getting your photographs taken, plus they’ll get everyone mingling. We’ve seen everything from Giant Jenga, Ping Pong and Croquet to Connect 4 and one of the latest crazes we’ve come across is Crazy Golf! 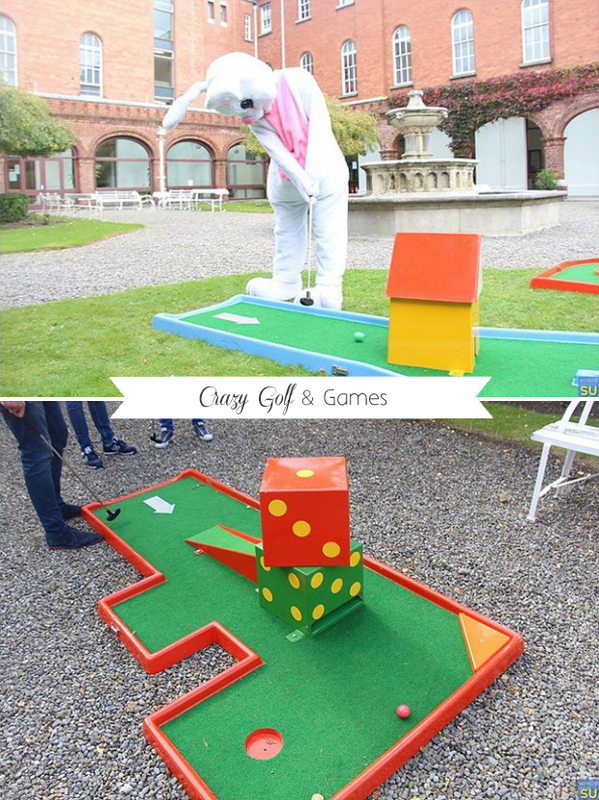 Irish company Crazy Golf Hire can come to you with a totally mobile, 9 hole crazy golf course so guests can enjoy this nostalgic challenge over some drinks. It works indoors and outdoors so don’t worry if the rain makes appearance! If you’re looking to keep guests on their toes, The Ice Breaker Challenge – a series of enjoyable games to test your balance and hand to eye co-ordination – is also sure to be a big hit and provide plenty of amusement to onlookers! The speeches are a great part of the day but they can drag on for some guests who are only too eager to get the party started. One way to make sure they’re a bit more entertaining is to leave ‘Speech Sweepstake Slips’ on the table so guests can hedge their bets on how long they’re going to last. It’s a great way to get people chatting and there’s nothing like a bit of friendly competition! Appleberry Press stock ready-made betting slips – check ’em out here. 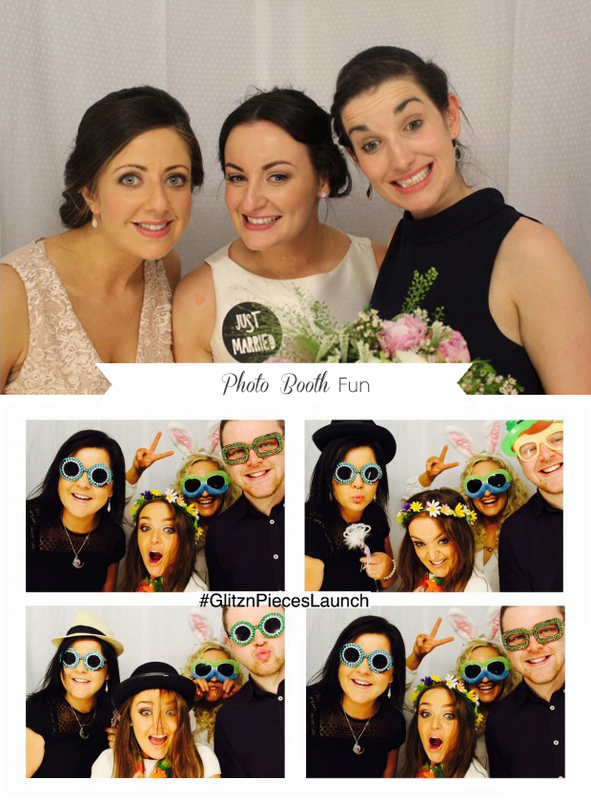 The photo booth has been knocking around for awhile but for good reason – guests LOVE it! More and more coupes are pooling together what they would have spent on individual favours and are hiring a photo booth or video booth instead – if you’re looking to be one step ahead of the trendsetters, the latest take on the photo booth, the ‘Selfie Box‘ is sure to really impress your guests. Fun selfie style photos minus the awkward stick! Find out more about the Selfie Box here. If you’ve the budget and you’re looking to really impress the guests with kids, a minder is the way to go! 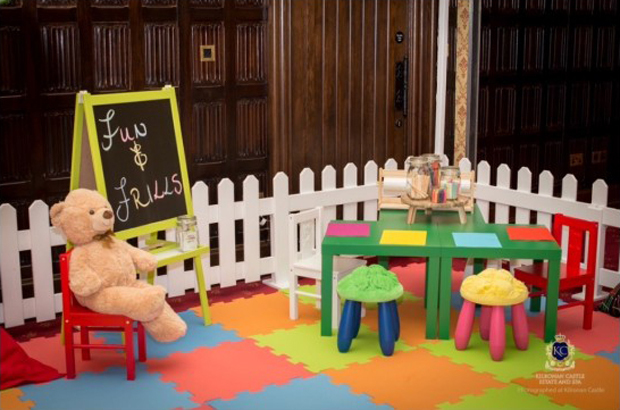 Give your guests with children the luxury of enjoying the celebrations by having someone on hand to keep the kids busy. Fun ‘n Frills are childminders that provide Supervised Portable Activity Areas for children at weddings – they set up in the ballroom so they can see you and vice versa but most importantly, someone is keeping the little guys entertained with fun activities and games such as arts and crafts and play doh so the adults can really relax and enjoy the day. You’d rarely have seen pets at weddings a few years ago but now proud pooches are by their owners side at the happy event, donning bow ties and floral crowns in honour of the occasion! 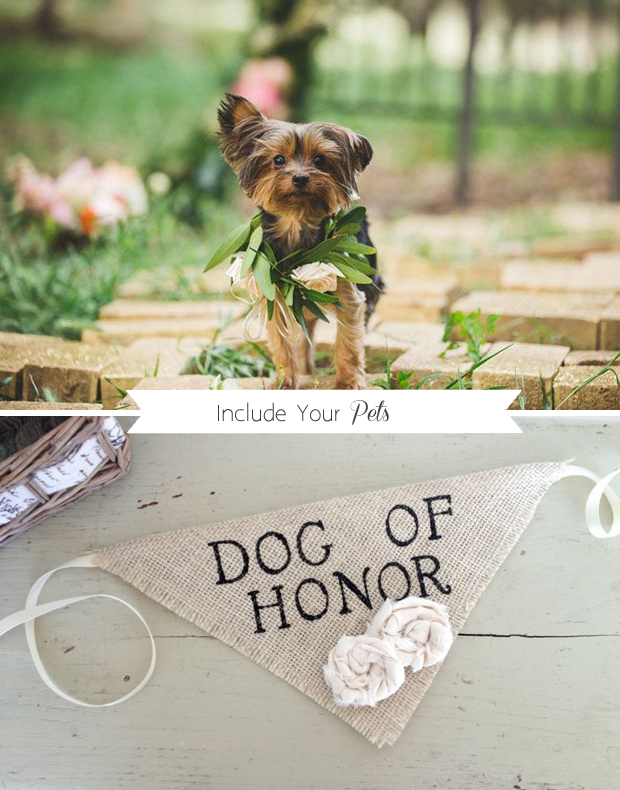 The photos are adorable so if you do have a family pet you’d like to include in your Big Day, check out these 10 super cute Pets at Weddings for inspo. If you’re looking to end the night on a colourful high, break out the glowsticks! They’ll light up the dance floor and will get guests in party mode, plus the photos will be awesome. Pick them up in the likes of Dealz for €1.50 for a pack of 20.